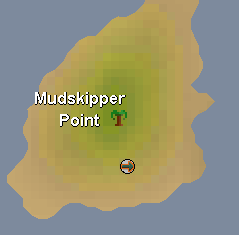 Mudskipper Point is a small peninsula south of Port Sarim and Rimmington. 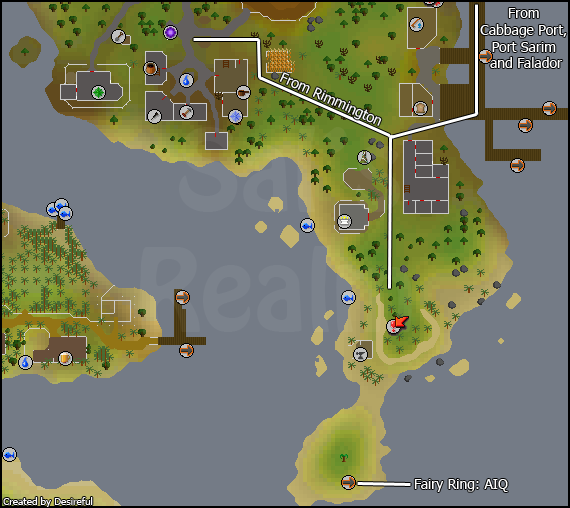 It is home to Thurgo the dwarf whom is the Master of Smithing. Other interesting aspects of this area include the Asgarnia Ice Dungeon which include Blurite ore needed in The Knight's Sword quest, a temple, some fishing spots, and to some - it is a great place to hang out at! You can walk there from many different places. Requires: Lumbridge Explorer's Ring (3) and completion of all Lumbridge/Draynor Tasks. 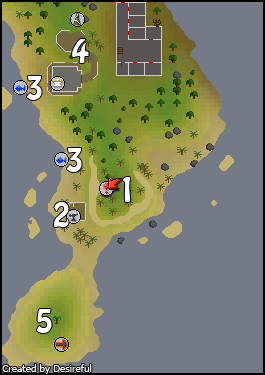 You can use a Lumbridge Explorer's Ring (3) to teleport to the cabbage field; Port Sarim and Mudskipper Point are both just a few short paces away. 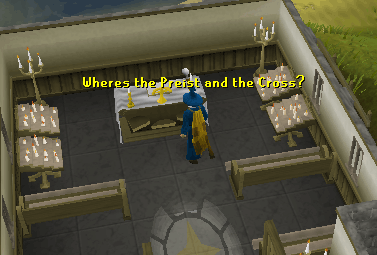 You can teleport to Falador and walk. Requires: Starting the quest Fairy Tale Part 2: Cure a Queen. 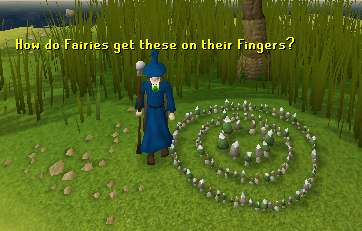 Simply use a Fairy Ring with the Coordinates of AIQ. Note: This is the most direct route. Requires: Level 40 Magic, Player Owned House In Rimmington. Simply Teleport to your player owned house in Rimmington. Mudskipper point is just a short distance southeast. The Ice Caves are home to Muggers, Pirates, Hobgoblins, Ice Warriors, Ice Giants, and even Skeletal Wyverns. 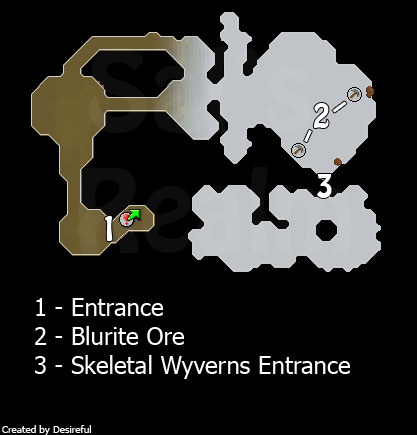 This is the only place a free to play player can obtain Blurite Ore, and it is a vital part of the Knight's Sword Quest. 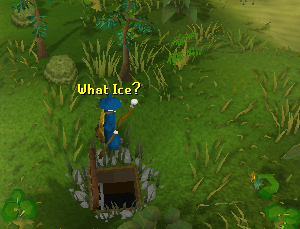 Some freeplayers enjoy training on Ice Warriors and Ice Giants for their drops, while others prefer to train on the Hobgoblins in hope of obtaining Limpwurt Roots. There are also Skeletal Wyverns in the very back of the cave, which are very dangerous. 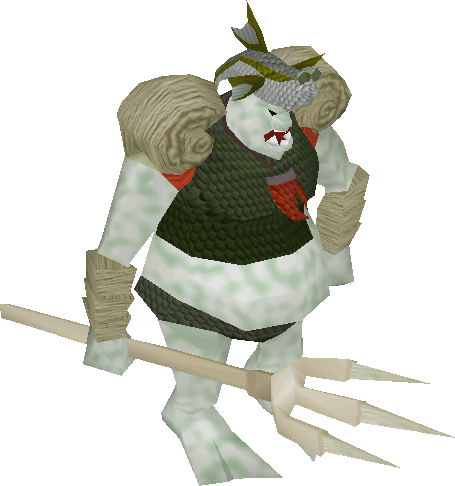 Thurgo is the one of the last surviving of the Imcando Dwarves. These dwarves are master smithers and thus Thurgo is the Smithing Master. 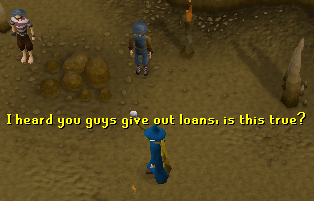 He is the person you should go to if you want to buy a Smithing Cape of Achievement once you reached 99 smithing. He also has a role in the Knight's Sword Quest, and he smiths the Blurite Sword copy for you. Both spots are net and bait fishing spots, meaning that you won't be catching any freshwater fish here. Possible catches include Shrimp, Sardines, Herring and Anchovies. The Graveyard is small and has a few stones that seem to be vandalized or old. The Church itself is pretty standard with an altar to recover Prayer points. Immediately north of the Graveyard are two rat holes and a small Summoning Obelisk used to recharge Summoning points. 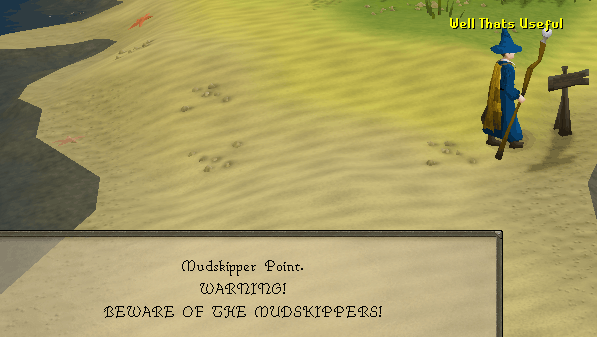 The tip of Mudskipper Point holds a Fairy Ring and a tree or two. Besides that, the tip of the peninsula is fairly empty. However, it is common for PvP matches to be held here. 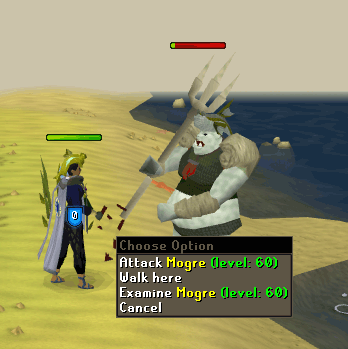 You can fight Mogres by throwing explosives into fishing spots. 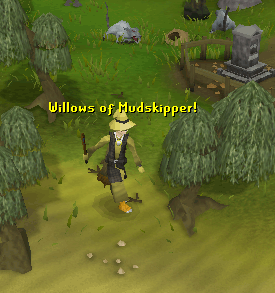 On a side note, the peninsula is home to many trees, including regular trees and willow trees which can prove useful for woodcutting. An Imcando Dwarf and the Master Smither. 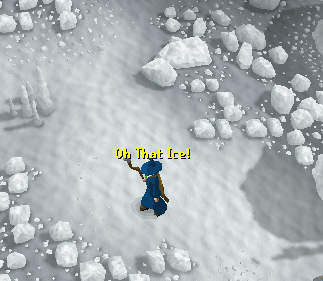 Found in the Ice Caves near the treasure chests. Found immediately upon entrance to the Ice Caves. Found in the Back of the Ice Caves near the Blurite rocks, mixed in with the Ice Giants. Found in the back of the Ice Caves near the Blurite rocks, mixed in with the Ice Warriors. Found in the Members-only section of the Ice Caves which is found through a tunnel near the back near the Blurite rocks. Found between the Ice Warriors/Giants and the Pirates in the Ice Caves. Found wondering around the northern part of the area. Found by dropping explosives into fishing spots.